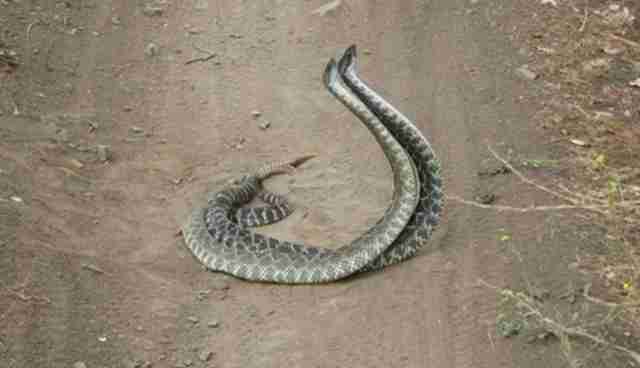 A pair of rattlesnakes tangoed for about four or five minutes last Sunday, after they crossed paths on a dusty bike trail that runs through California's Sycamore Canyon in the Santa Monica Mountains park. At first believed to be a female and male pair performing a mating ritual, the two snakes aren't a couple, says Greg Pauly, a herpetologist at the Natural History Museum in Los Angeles, Calif.- rather, they're males attempting to assert dominance through a so-called "combat dance." They not only chose to perform their "dance" in the middle of the trail, but they ignored the onlookers with cameras. Once they were finished, they fired up their rattles and slithered off to opposite sides of the trail, as if to say "that's all folks! Rattlesnake courtship can last multiple days, as this National Geographic clip shows (though, fair warning: there are graphic shots of viper coitus and a few cringeworthy puns). 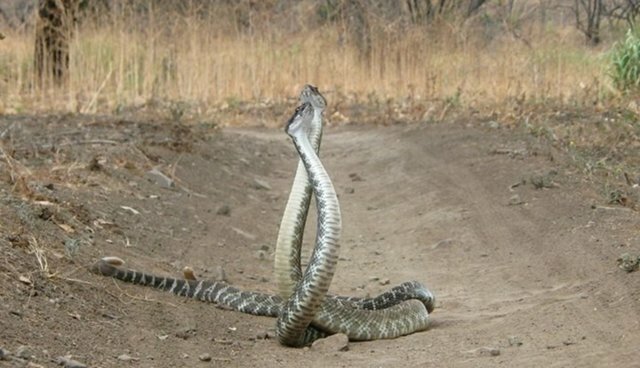 The interaction between male rattlesnakes, on the other hand, tends to be quite a bit shorter and involves one male trying to stretch taller than the other. 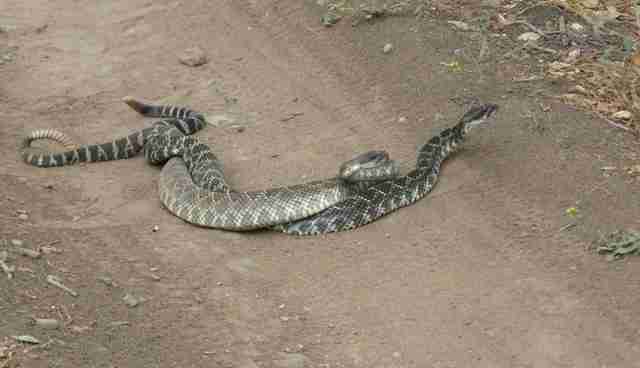 Male rattlesnakes will often spend multiple days with a female until she is ready to mate. If another male comes along, the two males will engage in this "combat." The combat typically involves the two rising up into the air and trying to push the other back to the ground. Usually the larger male wins and the other leaves the area. The victor gets to stay. "So what people often don't realize when they are watching this wrestling match," Pauly writes, "is that somewhere close by is probably a female rattlesnake."